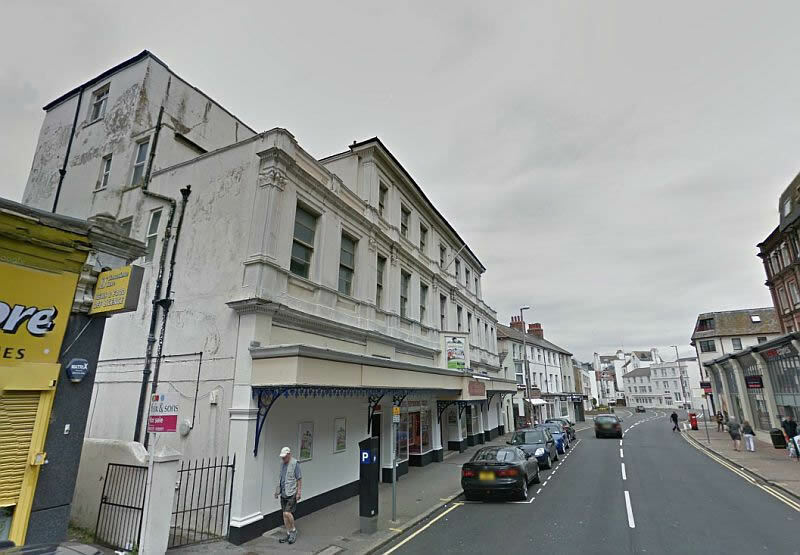 Above - A Google StreetView Image of the Royal Hippodrome Theatre, Eastbourne today, formerly the Theatre Royal Eastbourne - Click to Interact. The Royal Hippodrome Theatre is situated on Seaside Road, Eastbourne and originally opened as the Theatre Royal and Opera House on Thursday the 2nd of August 1883 with J. L. Toole in a production of 'A Fool and his Money' and 'The Steeplechase'. The Theatre was was designed by the well known Theatre Architect C. J. Phipps and built for its proprietor George Loveday at a cost of nearly £9,000. 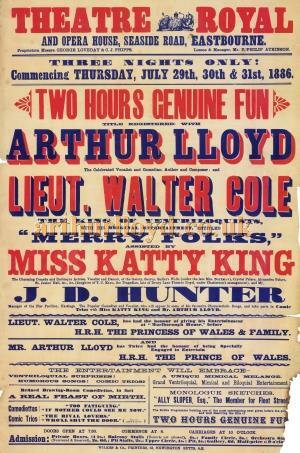 Right - A Poster for Arthur Lloyd's 'Two Hours Genuine Fun' at the Theatre Royal, Eastbourne just 3 years after it was built, in July 1886. The company included Arthur Lloyd and his wife Katty King, Lieut., Walter Cole, and J. D. Hunter, the then manager of the Pier Pavilion, Hastings - Click to Enlarge. A licence for running the new Theatre was applied for in July 1883 and the ERA carried details of the hearing in their 21st of July edition saying:- 'At the Eastbourne Petty Sessions on Monday, before a full bench of magistrates, Mr Percy Gye, barrister - instructed by Mr Fladgate, of London - applied, on behalf of the lessee of the New Theatre Royal and Opera House, Seaside-road, a dramatic licence for that newly-erected building. Mr Gye said that he applied on behalf of Mr Waldtern Pegg, who had been for some time manager of the theatre in Paisley. The theatre had been constructed by Mr Phipps, architect, of London, who had it was scarcely necessary to say, considerable experience for many years in the construction of such buildings. He had built no than thirty different theatres in various parts of the kingdom, and had had a very large London Business in constructing and altering theatres. 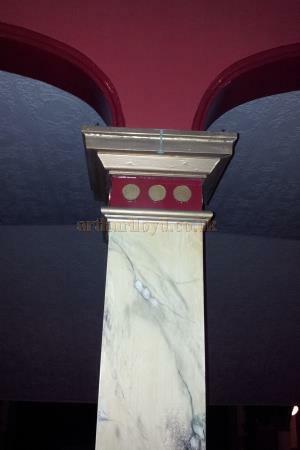 Left - One of the marbled Columns at the Royal Hippodrome Theatre, formerly the Theatre Royal, Eastbourne, in September 2013 - Courtesy George Richmond. Above - An early photograph of the Theatre Royal and Opera House, Seaside Road, Eastbourne in 1902 - From 'The Playgoer' 1902 - Courtesy Iain Wotherspoon. ...The ground level was of course, occupied by the pit, which was constructed to hold 500 people. 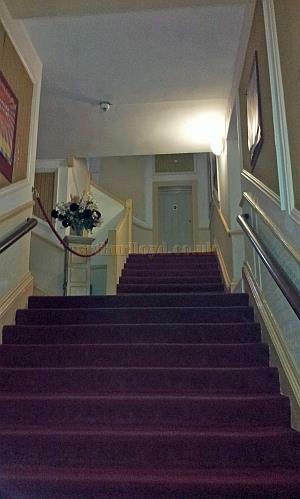 It had an entirely separate entrance from any other part of the theatre, 5ft. wide, from Seaside-road, in a straight line into a pit. In addition - presuming there was any panic - there were two additional exits from the pit, on each side of the theatre, leading into the open spaces; so that they had three doors by which to get out. The first floor, which was called the balcony stalls, was seated to hold 180 persons. He might here mention that there would be a staircase on each side of the central vestibule - the one to the right would accommodate the audience going to the balcony stalls, and the one to the left the audience going to the second tier, to be known as the upper circle. The latter would hold 200 people. By this arrangement there would be no danger of a combination of people. 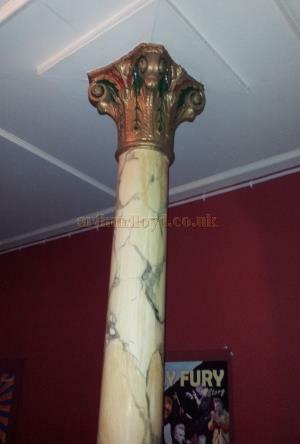 Right - One of the marbled Columns at the Royal Hippodrome Theatre, formerly the Theatre Royal, Eastbourne, in September 2013 - Courtesy George Richmond. The corridors to the balcony stalls and to the second tier were both 7ft. wide; that, for the passage of so small a number of people, was more than ample. The gallery also was small, holding only about 300 people. The exit was by an entirely separate doorway in the Seaside-road; it was disconnected in every way from any other entrance to the building. The whole of the passages and staircases were built of bricks and cement concrete, which was proved to be the best material to resist fire. All the staircases had hand rails, so that - presuming there were any crush - it would prevent people falling down. Every door in the theatre opens outward; in fact, every possible means had been taken to prevent any of the possible dangers which might happen; everything had been done to render the theatre one of the very safest and best description. All the minor details, such as ventilation, had been carefully conceived and thought out. 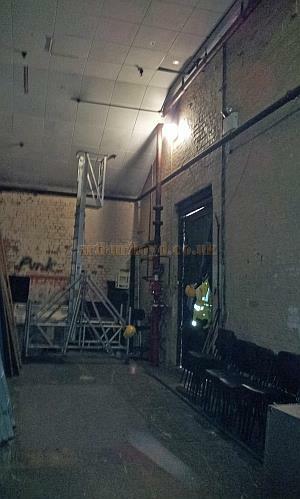 Left - The Scene Dock at the Royal Hippodrome Theatre, formerly the Theatre Royal, Eastbourne, in September 2013 - Courtesy George Richmond. At this point the magistrates held a short consultation, after which the chairman announced that the bench were of opinion that the evidence of the architect would only be required, as there was no opposition. 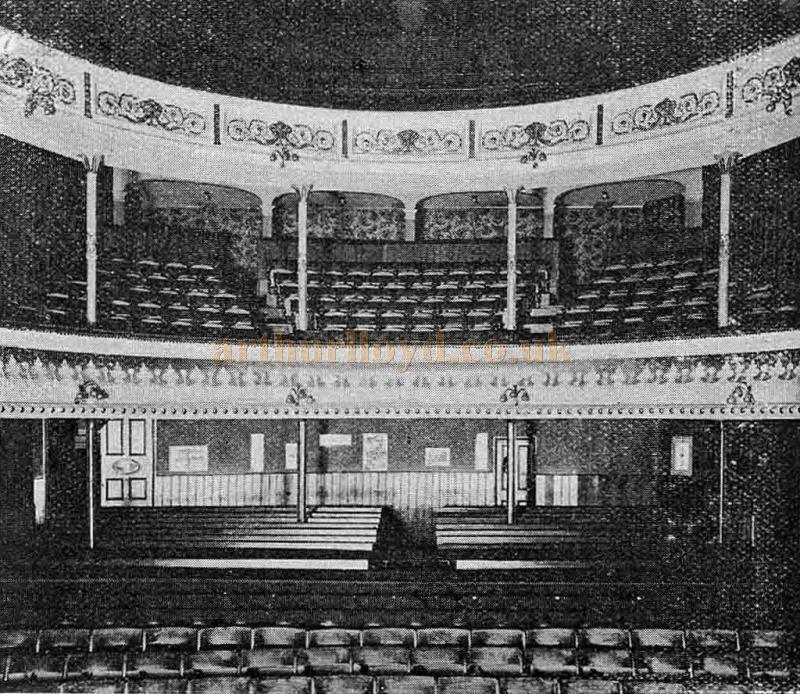 Above - The Auditorium of the Theatre Royal, Eastbourne in 1902 - From 'The Playgoer' 1902 - Courtesy Iain Wotherspoon. Above - The auditorium of the Royal Hippodrome Theatre, Eastbourne, formerly the Theatre Royal, in September 2013 - Courtesy George Richmond. ...The Chairman said that the statement was unusually satisfactory. The next question would be as to whether the theatre would be conducted respectably. Mr Gye said that the sureties would answer for that. But the bench had full power under the Act to deal with that matter. 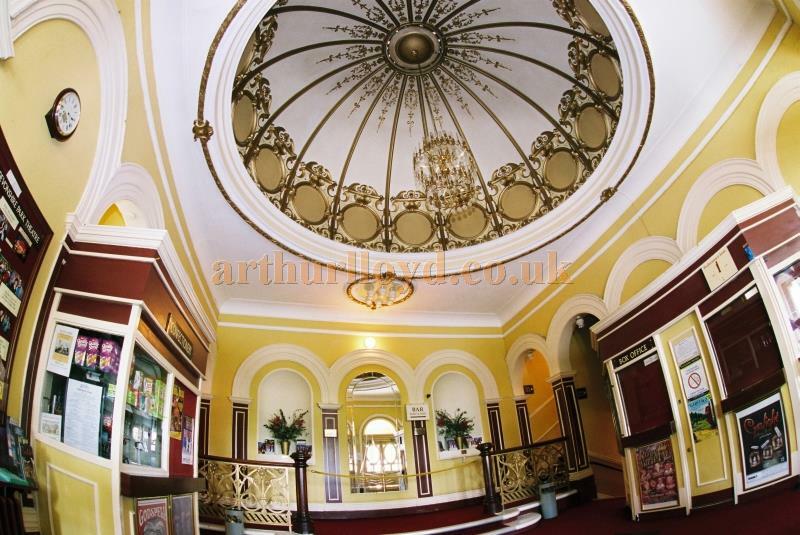 Above - The auditorium and stage of the Royal Hippodrome Theatre, Eastbourne, formerly the Theatre Royal, in September 2013 - Courtesy George Richmond. ...The Chairman said that, subject to the signatures of the sureties, there would be no objection to the g7ranting of the licence asked for. He might also say that, if they made the theatre a legitimate "home of the drama," it would be a good thing for Eastbourne. But he hoped it would not be allowed to degenerate into anything of the music hall type. Mr Gye thought that under the management they had got, everything would be carefully attended to. The terms of the licence were then read over, and the document signed by four of the magistrates, after which the two sureties (Mr Phipps, architect, and Mr G. B. Loveday, of Woburn-place, London), who are also the proprietors of the theatre, entered into a recognisance for the necessary sum; Mr Pegg, the manager, also taking an obligation to adhere to the terms of the licence. We may add that the theatre will be opened on August 2nd with Mr J. L. Toole, who there, after playing for three days at Hastings, commences his provincial tour. The above text in quotes was first published in the ERA, 21st July 1883. Above - Cast Details from a Programme for 'Review of Revues' at the Royal Hippodrome Theatre, Eastbourne on April 9th 1928 - Courtesy Roy Cross. The Theatre duly opened on Thursday the 2nd of August 1883 and ran mostly as a legitimate playhouse for the next 21 years. 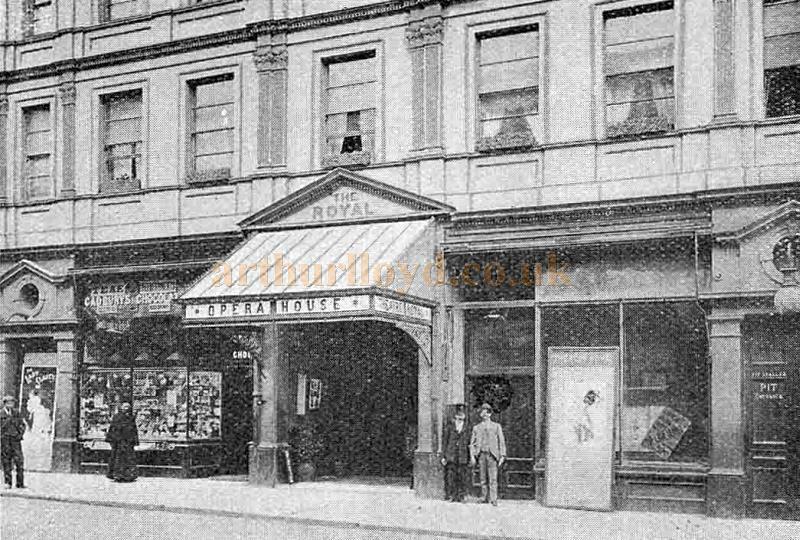 In 1902 the Playgoer published an article about the Theatre Royal saying:- 'The Theatre Royal, Eastbourne occupies a fine site in the centre of the town. 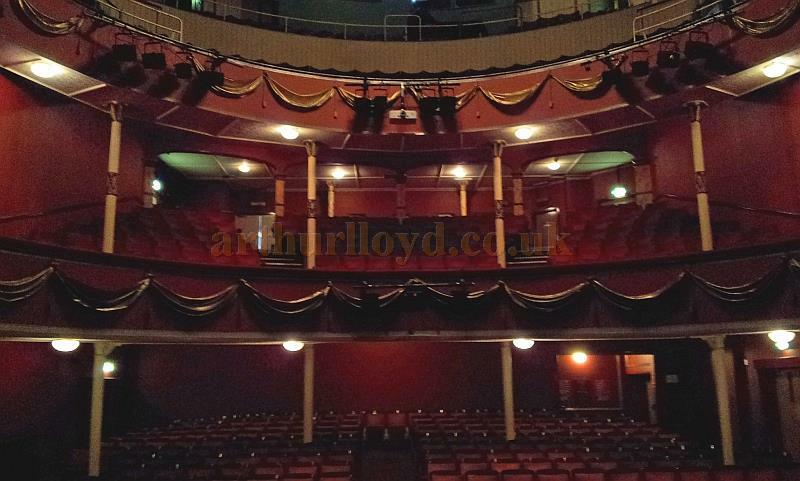 Right - The auditorium boxes of the Royal Hippodrome Theatre, Eastbourne in September 2013 - Courtesy George Richmond. 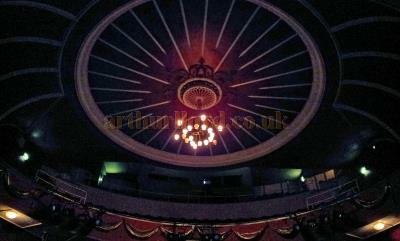 Left - The Auditorium Ceiling of the the Royal Hippodrome Theatre, Eastbourne in September 2013 - Courtesy George Richmond. The above text was first published in 'The Playgoer' in 1902 - And is courtesy Iain Wotherspoon. Above - FOH at the Royal Hippodrome Theatre, Eastbourne in September 2013 - Courtesy George Richmond. 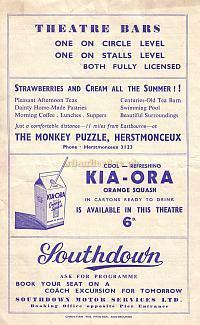 A couple of year after the above article was published the Theatre closed for extensive refurbishment. The last performance at the old Theatre Royal was on the 31st of October 1904, which was a benefit for its manager, Samuel Lloyd. Lloyd had already set up a new Company called the Eastbourne Hippodrome Company, along with his new partners S. W. Winter and T. W. Gowland, and after the Theatre Royal closed the Theatre was refurbished and altered for its new use as a Variety Theatre with a Music Hall Licence. Right - A Poster for 'All Smiles' at the Royal Hippodrome Theatre, Eastbourne - Courtesy Stephen Wischhusen. The refurbishment retained Phipps original auditorium, newly repainted in cream and gold, and relit, but there was no structural change to its proscenium and rakes although the capacity was increased to 1,500 plus 300 standing, which must have been quite a squeeze. Entrances and exits however, were remodeled to facilitate the larger audiences and the quick changeover of patrons between the twice nightly shows. Entrance prices were reduced but new larger bars were added FOH so that income from drinks could make up for the reduced entrance prices. Residential flats behind the Theatre were dismantled to make room for the new bars. Left - FOH at the Royal Hippodrome Theatre, Eastbourne in September 2013 - Courtesy George Richmond. A new safety curtain was also installed at this time, stage machinery enhanced, and new dressing rooms constructed where the manager's office was formerly situated so that there were now a total of 11. 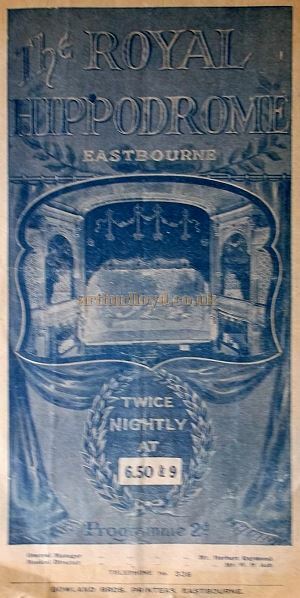 The whole refurbishment took just five weeks and the newly refurbished Theatre opened on Monday the 5th of December 1904 with the new name of the Eastbourne Hippodrome, and with a policy of twice nightly variety shows with no intervals. The first show would be at 7pm and the second at 9pm. The Theatre was later renamed The Royal Hippodrome, the name it still retains today. 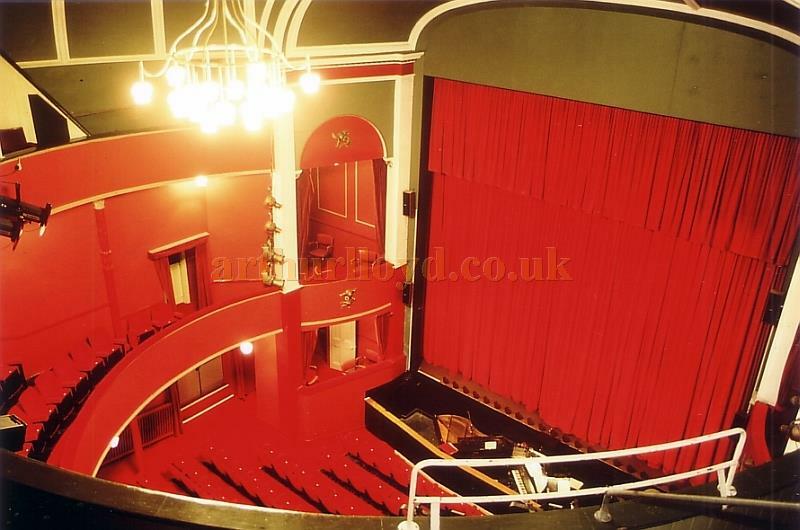 In an attempt to modernise the Theatre in the early 1980s the auditorium was altered by boxing in the circle and box fronts which had formerly been enriched with delicate Adamesque ornament. (See photo below). The new look was cleaner but spoilt the atmosphere of Phipps original decorations. By the late 1980s, the Theatre was becoming tired and so were its audiences. 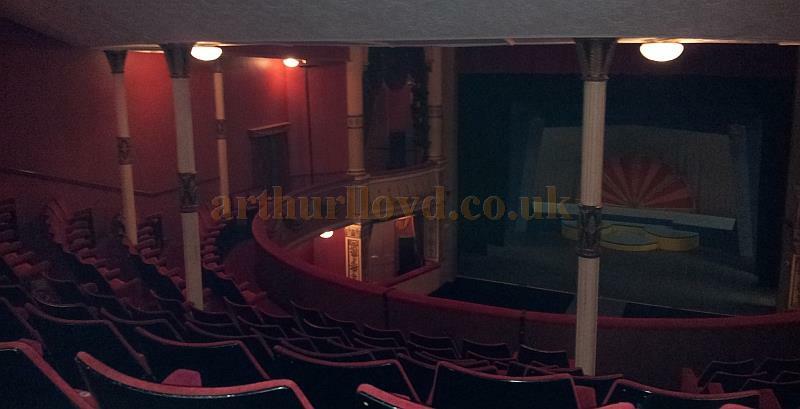 Plans were put together for its demolition but local opposition in the early 1990s and a restoration fund headed by Russ Conway, who then lived in the town, raised sufficient funds to have the proscenium arch, boxes, and circle fronts of the Theatre restored. This led to the Theatre being Listed and its future secured. Right - A programme for 'A Festival of Agatha Christie plays' at the Royal Hippodrome, Eastbourne. 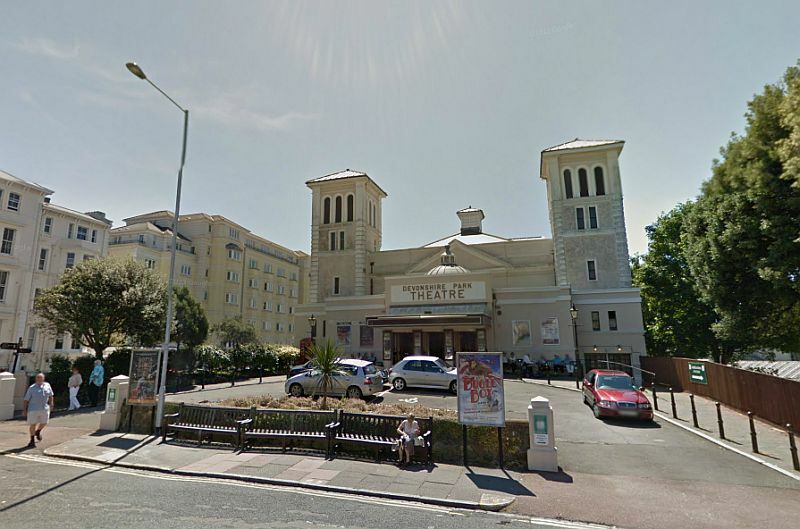 On the 6th of February 2013 Eastbourne Council agreed to grant a licence to the Royal Hippodrome Theatre Management to run the Theatre as a Community Interest Company so that they could run it as a combined community venue and professional Theatre. 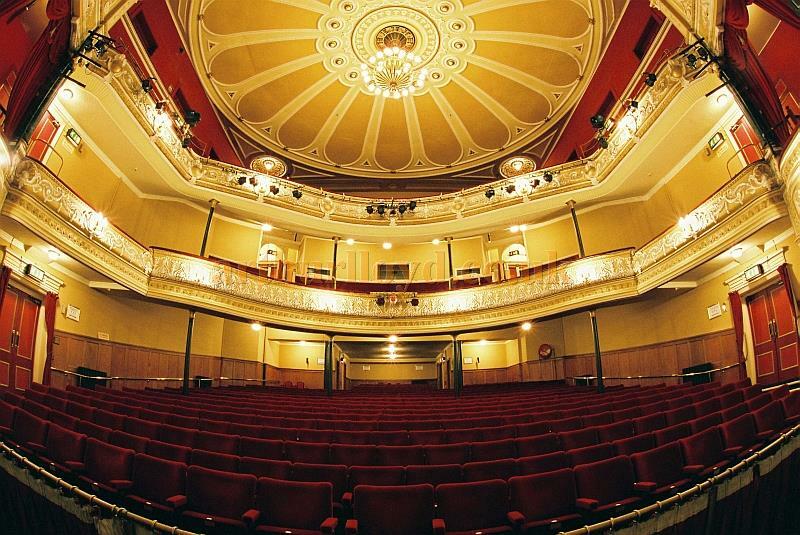 The Royal Hippodrome Trust which was set up in 2010 are now the guardians of the Theatre, whilst the Theatre's Management hope to interest local groups to invest their time and money into the building, and to secure funding for its future. 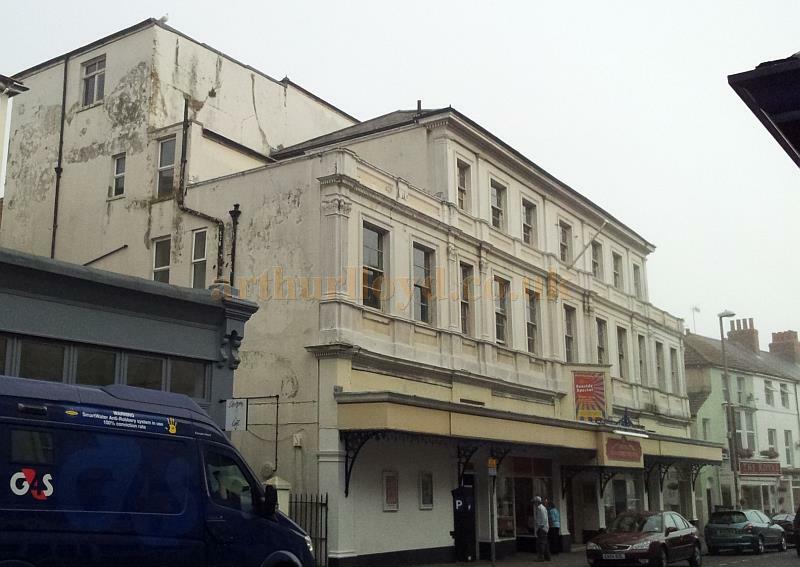 It also hoped that they will be able to gain grants to refurbish the exterior of the building and they are working with 'Big Local', the Organisation authorised by the National Lottery to allocate £1 million over 10 years to the council ward in which the Royal Hippodrome Theatre is located. 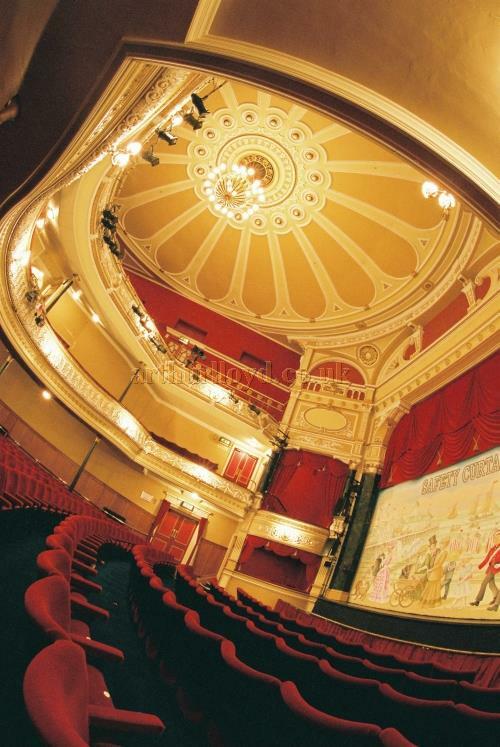 In 2013 the Theatre is celebrating its 130th anniversary, and currently seats 643. You may like to visit the Theatre's own Website here. 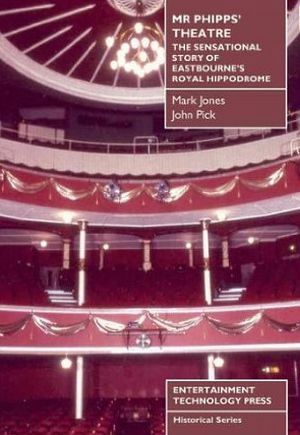 You may also be interested in 'Mr Phipps' Theatre', a book by Mark Jones and John Pick (Shown Left) which describes in great detail "The Sensational Story of Eastbourne's Royal Hippodrome" - formerly the Eastbourne Theatre Royal, which is highly recommended. The books sets the story against a social history of the town and contains a Foreword by Peter Longman, then director of The Theatres Trust. - Click to buy the book at Amazon.co.uk. Photographs for this Theatre from September 2013 were kindly sent in by George Richmond, and taken with kind permission of the Hippodrome Theatre, Eastbourne. 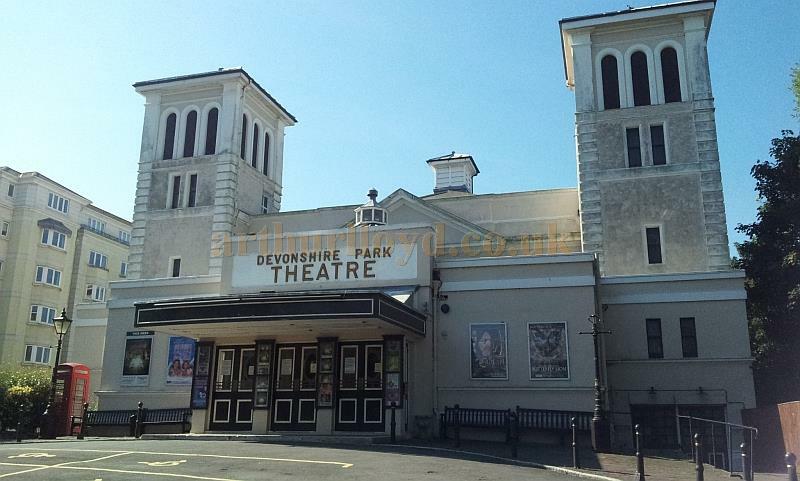 The Devonshire Park Theatre was originally built by Henry Currey who was also the architect who designed St. Thomas Hospital in London, and the seventh Duke of Devonshire's own architect. The Theatre was built in 1884 on land which was given by the Duke of Devonshire and formed part of a complex of buildings which would not be completed until 1891. The first building constructed on this land was the Winter Garden which was built in 1876, then came the Theatre in 1884, and finally the Indian Pavilion in 1891, all constructed by the Devonshire Park and Baths Company. 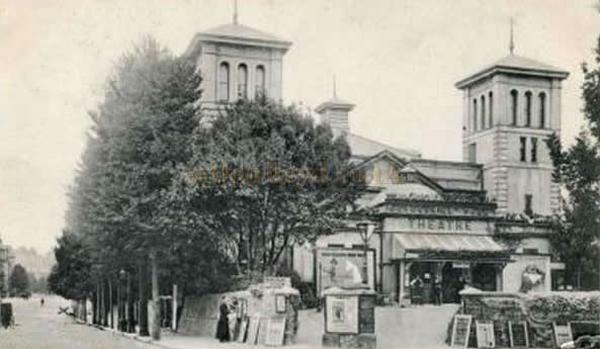 The Devonshire Park Theatre opened on Whit Monday, 1884 and the ERA published a review of the Theatre in their 7th of June edition saying: 'For some time the want of a theatre or dramatic hall in connection with Devonshire Park, Eastbourne, has been a source of considerable inconvenience. Right - An early 1900s postcard showing the Devonshire Park Theatre, Eastbourne. It is true that the Pavilion has been utilised, but this building was never intended for such a purpose, and its acoustic defects have considerably marred the attractiveness of the entertainments from time to time given therein. The directors have therefore erected at the south eastern corner of the grounds, adjoining Hardwick-road, a suitable theatre, complete in every detail, which was duly licensed on Monday, the 26th ult., and was brought into use on Whit Monday. Above - The Foyer of the Devonshire Park Theatre, Eastbourne - With kind permission Justine Cager, Theatres Administrator, Eastbourne Theatres. The new dramatic hall is approached by a carriage drive from Hardwick-road. Ascending two or three steps we reach the entrance hall, which has a domed roof; in the centre is a small sunlight, which illuminates the whole area. On each side of the hall, which we may herto mention is handsomely carpeted, are one or two small retiring rooms, and on one side the ticket office. Ascending another short flight of steps, the corridor branches of in two directions, one leading to the orchestra stalls and the other to the balcony stalls. All fear of draughts is avoided by portiere draperies. 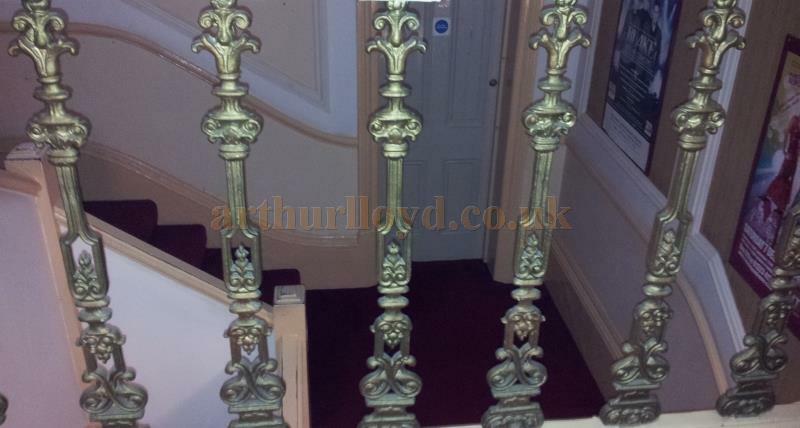 We notice just within the draperies a handsomely-fitted buffet and restaurant, and in another part a snug smoking-room for gentlemen, handsomely furnished with lounges and settees. Above - The auditorium of the Devonshire Park Theatre, Eastbourne - With kind permission Justine Cager, Theatres Administrator, Eastbourne Theatres. On the ground-floor are the orchestra stalls, 211 in number, while above are the first circle seats. Each seat is a comfortable arm-chair, covered with damask in cream and old gold, with cushioned arm rests and moveable seats. The pit is behind the orchestra stalls, and is somewhat contracted. It will only accommodate about 150 persons. The seats are separated from each other by iron partitions. Above the first balcony is a second, which will serve as an amphitheatre or gallery, and is a most commodious and extremely comfortable part of the house. Owing to the excellent arrangement of the interior, the whole of the stage will be visible from every seat in the house. There are no side galleries, customary in most theatres. In the centre of the roof is a sunlight, from which pear-shaped medallions radiate, bordered with gold. The ground is a light silver grey, enlivened by light crimson or lake. The front of the balconies are decorated in the same style, and the whole building has a most chaste and elegant appearance. There is a handsome buffet for the pit and amphitheatre, quite distinct from the stall buffet. Left - The auditorium and Safety Curtain of the Devonshire Park Theatre, Eastbourne - With kind permission Justine Cager, Theatres Administrator, Eastbourne Theatres. The pit and amphitheatre have separate entrances at the sides of the building, and every arrangement has been made to enable the house to be cleared in a few minutes in case of fire. All the staircases and approaches are fireproof, and water is laid on in every part, which can be made available at a moment's notice. In fact, every precaution has been adopted to make the hall in all respects as safe from danger as possible. Leaving the front of the stage, we pass through some fire-proof doors to the mysterious regions below. Here we find ourselves in a perfect labyrinth of peculiar machinery, used for dramatic purposes - traps to send sprites flying into the air, or to raise fairies to earthly regions. The building is lit with gas, and both the sun and foot lights are constructed on the flash principle, so that in an instant the theatre can be bathed in light or shrouded in darkness. Behind the stage is a spacious green-room, and a number of commodious dressing-rooms, all carpeted, and properly furnished, for the convenience of the ladies and gentlemen engaged on the stage. The above text in quotes was first published in the ERA, 7th of June 1884. By 1900 the Theatre seems to have become rather unloved, an article in the ERA of the 24th of November that year remarks on the plain auditorium and failed productions, although a visit by Winston Churchill did revive the place for one night at least. The ERA says: 'Eastbourne audiences evidently prefer their entertainments cast in a more serious form than is usually presented at the Devonshire Park Theatre. Many theatrical companies have failed to be attractive at ordinary prices - owing to the fact that the auditorium is nothing much better than a large room, which sadly wants decoration and is without even a private box - whereas Mr Winston Churchill on Monday afternoon packed the theatre from floor to ceiling at nearly double charges for admission. The audience was fashionably passive, and listened with sedate attention to the distinguished lecturer. Mr Churchill is not an orator, and he has a slight lisp, but his voice is clear and carrying. In his views on the war he blames no one, and apportions praise only here and there; in fact, criticism is carefully avoided.' - The ERA, 24th of November 1900. The above situation seems to have spurred on the owners to have the Theatre remodeled and so in 1903 the Theatre was redesigned by the renowned Theatre Architect Frank Matcham who incorporated Henry Currey's original balconies whilst extending them to the proscenium and adding two boxes on either side. 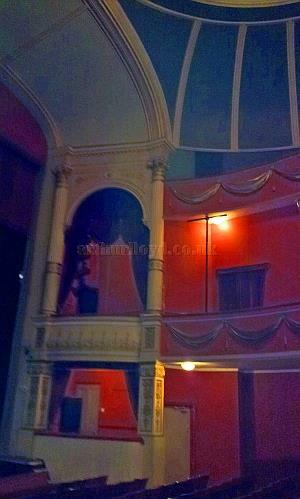 The balcony fronts were redecorated with a more 'flamboyant' plasterwork, and the proscenium made rectangular. 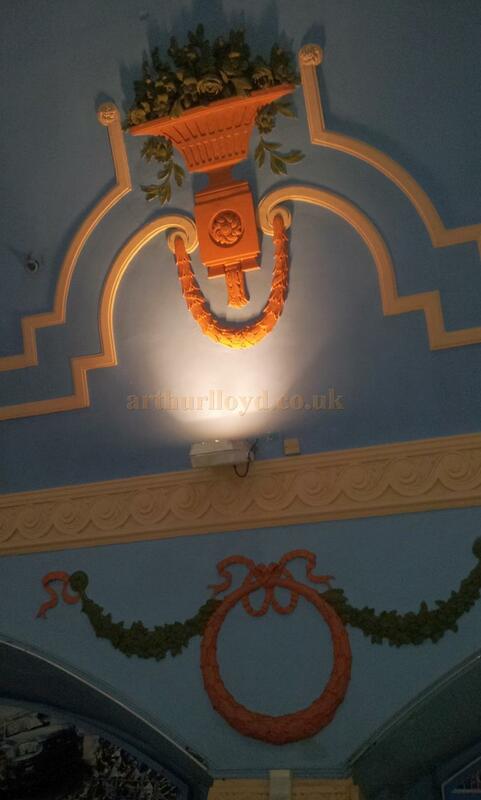 The original ceiling of the auditorium was also enhanced with Matcham's well known flair for decoration. A lucky survivor, the Theatre remains today in this 1903 Frank Matcham form and is Grade II Listed with a seating capacity of 936. If you have any more images for this Theatre that you are willing to share please Contact me. Above - A Google StreetView Image of the Congress Theatre, Eastbourne shrouded in scaffolding during repair work to the building's structure in 2010 - Click to Interact. The Congress Theatre is situated on Carlisle Road, Eastbourne and was designed by Bryan & Norman Westwood & Partners. The Theatre was constructed to house West End musicals, ballet, opera, comedy and live music, and seated some 1,689 people when it first opened, with a licensed bar and facilities for the disabled. The Theatre's inaugural concert was performed by the London Philharmonic Orchestra on the 13th of June 1963, although it was first used by the Eastbourne College, a public school, which held its speech day there shortly before the 'official' opening of the Theatre. A few years later Princess Margaret and the Earl of Snowden attended a concert in aid of the Bishop of Chichester's Sussex Campaign in November 1965 at the Theatre, a plaque in the foyer commemorates their visit. 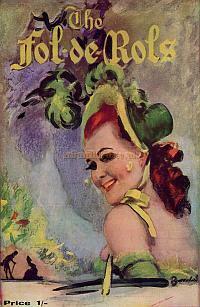 Right - A Programme for a production of 'Fol-de-Rols' at the Congress Theatre in its opening year - 1963. The Congress Theatre is a Grade II* Listed building but at the time of writing in January 2018 it has been closed for some time due to its need of renovation. in April 2010 it was shrouded in scaffolding to necessitate repairs, estimated to cost some £850,000, when parts of its concrete structure began falling off the front of the building. The building has been covered in scaffolding ever since but the council have said that it has used this time to draw up a list of other work that it needs to do to the building. These include a redesign of the upper two levels of the Theatre and replacing windows and frames. Weather resistant units and solar efficient glazing are also planned to be installed to avoid any future corrosion of the structure. When work begins on the full renovation of the Theatre it will be part of the £44 million pound Devonshire Park Project which is due for completion in the Spring of 2019. 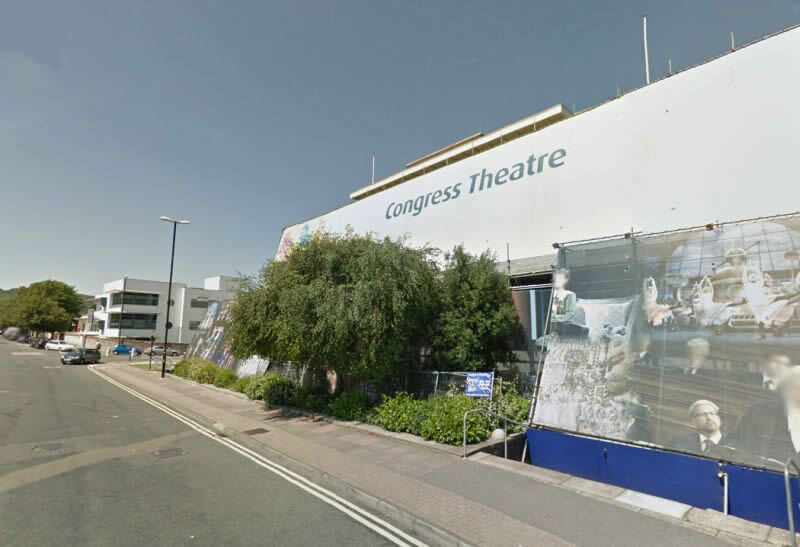 You may like to visit the Congress Theatre's own Website here. The Eastbourne Pier was designed by Eugenius Birch and constructed in 1870. Eugenius Birch also designed the Scarborough Aquarium, the Brighton Aquarium, and the West Pier, Brighton. 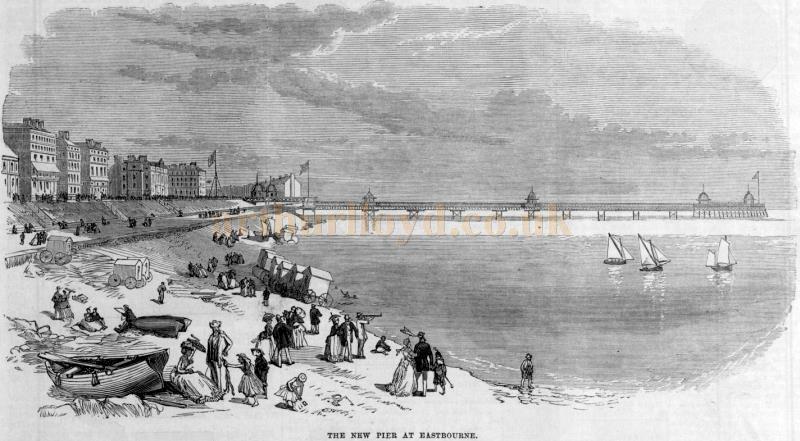 Right - A postcard showing the Eastbourne Pier and the later New Music Pavilion of 1888. The Illustrated London News printed a short report on the Pier whilst still under construction but partly open in their 25th of June 1870 edition saying:- 'The pleasant seaside town of Eastbourne, situated at the foot of the grand range of the Sussex Downs, close to the end of their cliffs at Beachy Head, and presenting in some of its streets a picturesque combination of neat buildings with the foliage of trees, will be improved with an additional feature of attraction by the completion of the new pier. This structure is but half finished, yet the first portion of it was opened, on Monday week, by Lord Edward Cavendish, son of the Duke of Devonshire, who is one of the chief proprietors of the town. 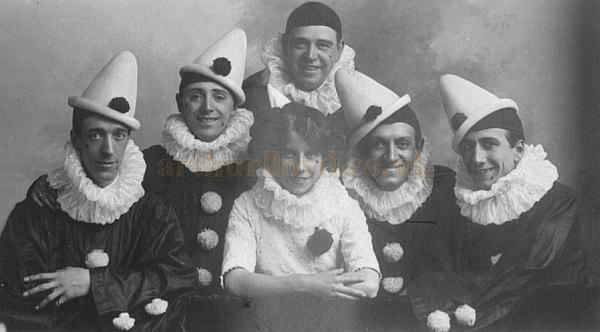 Left - The Olympian Concert Party who performed on the Eastbourne Pier in 1913 - Courtesy The East Dean & Friston Local History Group - The performers were Harry Jackson, Ernest Pitt, Harry King, Franklin Vernon, Charles Hawthorne, and Dorothy Eales. This structure is but half finished, yet the first portion of it was opened, on Monday week, by Lord Edward Cavendish, son of the Duke of Devonshire, who is one of the chief proprietors of the town. There was a procession, at one o'clock in the day, from the Sussex Hotel, passing through Cornfield-road, Seaside-road, and the Grand Parade. It was headed by the county police and the directors of the Eastbourne Pier Company, the engineers and contractors, in several carriages; the Fire Brigade, Odd Fellows, and Foresters, came behind; and the rear was brought up by the life-boat and its crew, drawn on a transport carriage by six fine horses. 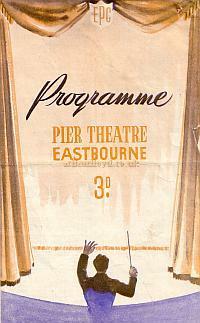 Left - A variety programme for 'Star Wagon' on the Pier Theatre, Eastbourne in 1951. The opening ceremony was performed on a raised platform covered with blue felt, in the presence of 500 or 600 spectators assembled on the pier. After a prayer by the Rev. H. R. Whelpton, Mr. W. Kirkland, in the absence of Mr. Campion Coles, the secretary, addressed his Lordship, and invited him to declare the pier opened. Lord E. Cavendish did so, with a brief speech, in which he dwelt on the advantages and prospects of Eastbourne. The Rev. Dr. Irwin, chairman of the Pier Company, also took part in the proceedings. They were followed by a dinner at the Assembly Rooms, and athletic sports in the cricket field. Above - Detail from the 'Star Wagon' variety programme for the Pier Theatre, Eastbourne in 1951. The above text in quotes, and its accompanying sketch (shown above), were first published in the Illustrated London News, 25th of June 1870. Above - The New Music Pavilion, Eastbourne from a postcard sent in 1926 - Courtesy The East Dean & Friston Local History Group. 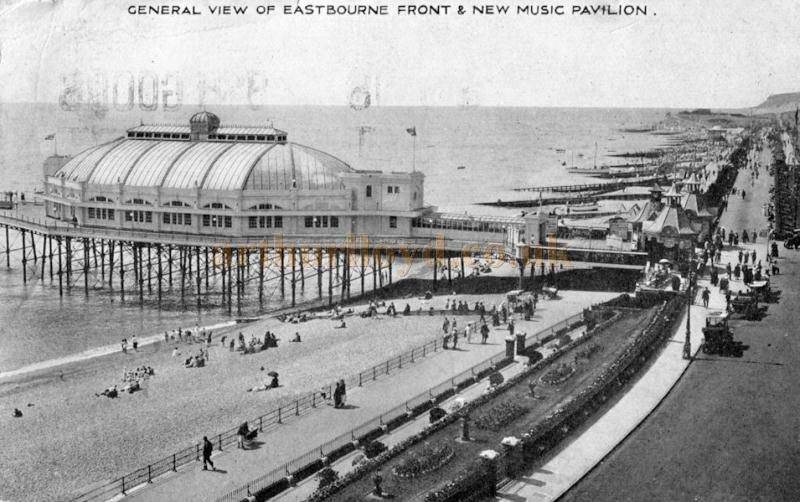 A Theatre was added to the Eastbourne Pier in 1901, replacing the earlier 1888 Music Pavilion (See Above). However, a major fire destroyed part of the Theatre in the 1970s and it was then converted into a 'Show Bar'. 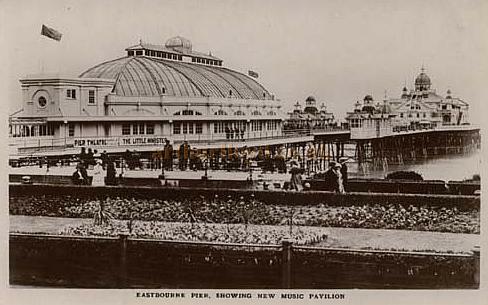 The Pavilion was later used as an amusement Arcade for many years (See photographs below), but in July 2014 it was destroyed when a major fire ripped through the Pier. Two thirds of the Pier was saved by the valiant efforts of the Fire Brigade and RNLI but at the time of writing the Pavilion's future looks uncertain. Many pictures of the fire from the BBC can be seen here. Above - A photograph of the inside of Eastboune Pier Pavilion in September 2013 - Courtesy George Richmond. 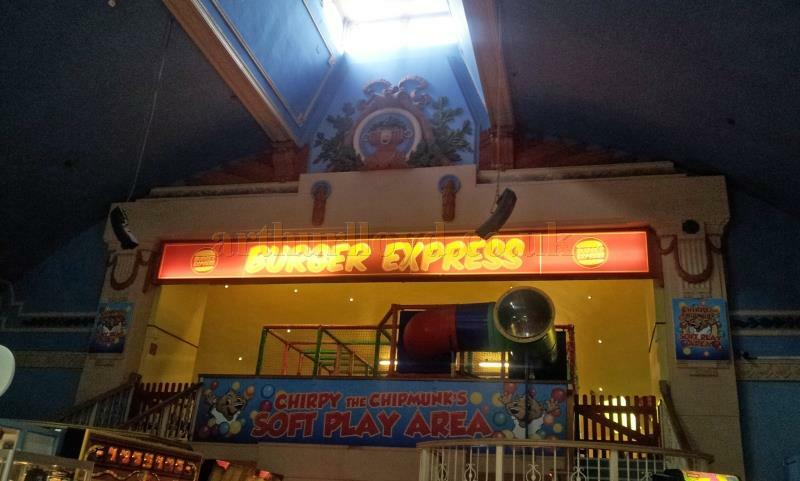 Above - A photograph of the inside of Eastboune Pier Pavilion in September 2013, also showing the Theatre's former projection box window - Courtesy George Richmond. 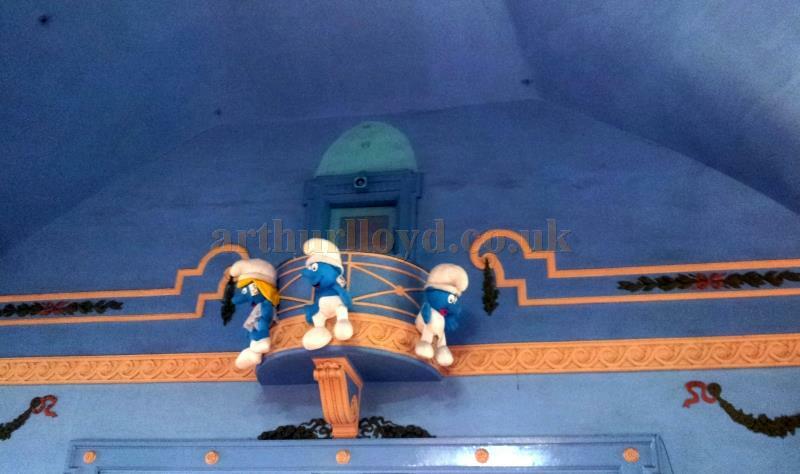 Above - A photograph showing some of the surviving plasterwork detail inside the Eastboune Pier Pavilion in September 2013 - Courtesy George Richmond.